That looks like a cute book! I love both of the ghost crafts too! Very interesting books and projects. Your kids did great. 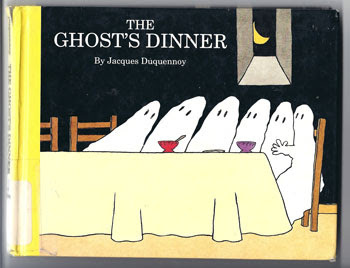 I am definitely going to add Ghosts Dinner to our reading list. We have not ventured into any ghost books yet, but this book sounds perfect - full of fun and friendly ghosts. I like how you differentiated this activity for each of your children. This week was our first time we linked to Michelle's stART and it has been so much fun. The bonus has been meeting other creative mums who have shared some great book recommendations and crafts. We're always on the lookout for new books to read. So cute! Thanks for linking up Read Aloud Thursday! I'm off to check out the other links! Adorable! 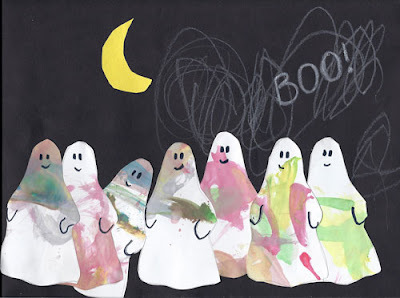 It looks like a cute, not scary ghost book. Confetti cake? I love it! Very nice project. 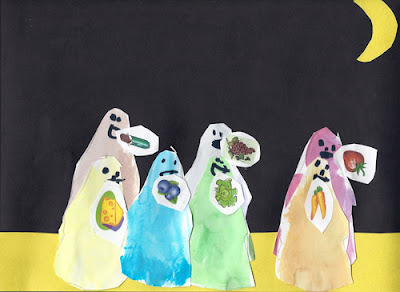 The book sounds like fun, and I'll look for it, but I am completely in love with your kids' artwork. Just beautiful! !